Wallis Simpson has been on my mind a lot lately – not just because she has a lot to do with the ‘set’ that I read so much about, but also because of Gillian Anderson’s excellent portrayal of her in the Any Human Heart adaptation. Then, of course, there’s the fact that half of Wallis’s jewellery collection has just been flogged at auction, breaking records and making millions in the process. The big seller was the Cartier-designed diamond-encrusted leopard bracelet you see above, which sold for a record-breaking £4.5m at auction. Swit swoo! Madonna is rumoured to have been the big spender responsible for buying it – wonder if it’s for the WE film, or her own use? For all your thoughts on Wallis and Edward, there’s no disputing that he was a fine jewellery buyer – and also a real old romantic. The deeply personal collection is full of beautiful pieces, which all have touching and slightly tragic stories behind them. This is my favourite lot, for sheer romance values. 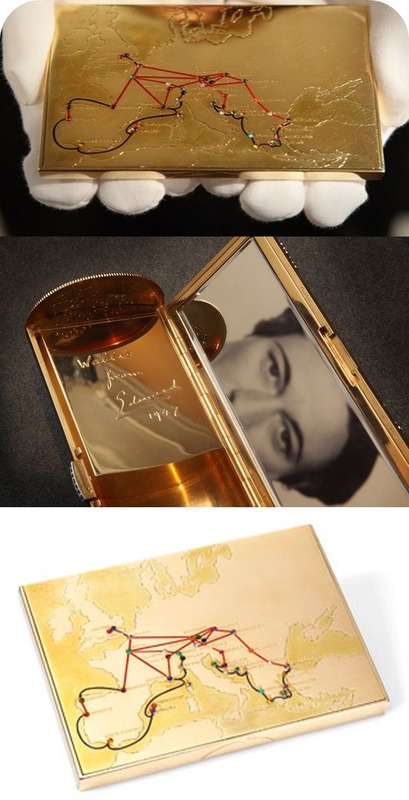 OK so first of all it’s an 18 carat gold and gem-set Cartier cigarette case; but more importantly it is decorated with a map, showing with gem stones the places the couple visited together. Isn’t that nice? Sigh. It’s engraved with, “Wallis from Edward, Christmas 1935”, and sold for £181,250. This bracelet is my favourite item, in terms of things I want to wear. It’s another piece of Cartier, and dates back to 1935 – Edward gave it to the Duchess, and she wore it on their wedding day in 1937. 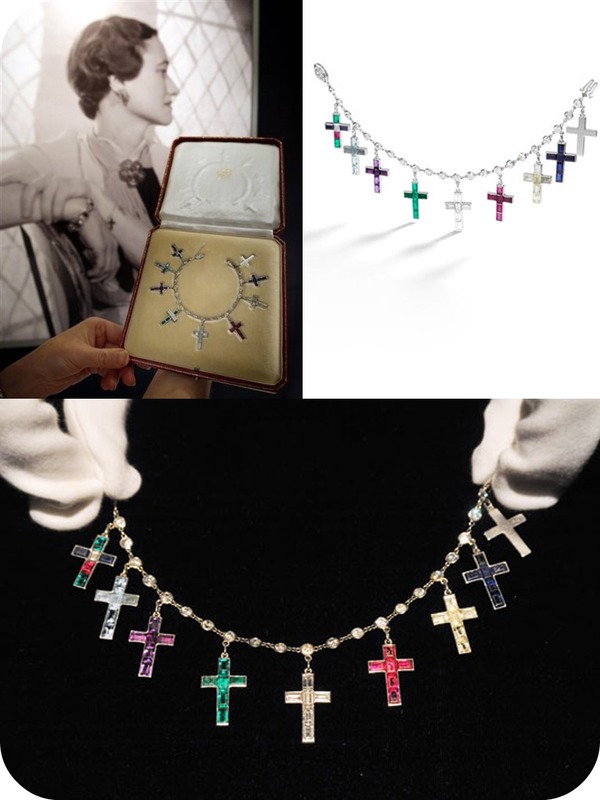 The nine gem crosses signify important incidents in their relationship – starting with number as on their wedding day. Wonder what the other eight were?? It sold this week for over £600,000. This diamond dress suite is also from Cartier, and dates from 1935. As with most of the jewellery Edward gave Wallis, it’s engraved with the intertwined initials W and E, and features the inscription (prepare yourself), ‘Hold Tight’. This phrase was kind of the couple’s motto, and they used it in most of their correspondence before his abdication. Too much! 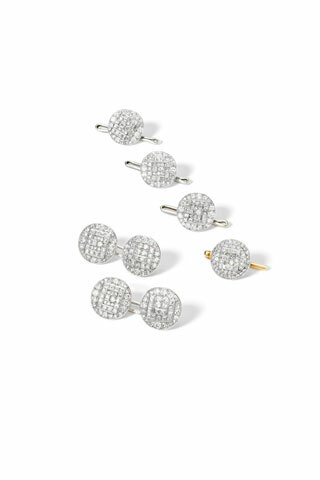 Read what else was sold, and for how much, on Professional Jeweller. I just saw a segment on the BBC World news last night about the leopard bracelet, ouch! To think it went for the GNP of most of the planet’s Third World nations. You do wonder, don’t you?